As one who loves food, this week has been a nightmare really. To start with, I've felt nauseous all the time, and was on doctor's orders to eat the most boring, bland meals ever. Being a stroppy sod, however, I couldn't bring myself to eat toast without a smidgen of butter or give up tea with milk. It didn't seem to have any adverse affects either, my forays into forbidden fruits. Naturally, I haven't felt the urge to cook which hasn't mattered much as my eldest has spent a marvellous week with his pals eating there or eating out (mum, can you buy the pizza?). I'm still off food though, the thought of it makes my stomach churn. Pity I didn't need to lose weight as food poisoning is a cracker for it. I could probably feed the national gas grid too - I'm burping tons, probably enough to run three small villages. If it continues, I'll have to go back to de doc, I suppose. Maybe I should try and flush out the bugs with some strong alcohol. Drown them in cognac. What a way to go! There's three quarters of a bottle of wine sitting on the table that's been there since last Sunday, tragically. I'm hoping it's managed to hold up and hasn't died an over-oxygened death. I was in Carrouf this morning with the boys. Both of them! My youngest is back from skiing, in one piece, and told me proudly that he'd gone down a black slope and has his third star. They talked me into buying all sorts of goodies I wouldn't normally, but then it's nearly the end of the holidays so it's nice to have something to ease going back to school. I thought I'd pass out a couple of times what with the effort of shopping, the standing up and all the people. I'm obviously not yet on tip top form and spent most of the afternoon in bed. 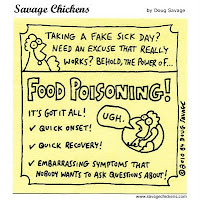 That's a really bad bout...sure it's just food poisoning? It's more than that, fly, something to do with bile and the vesicule. Fatigue and nausea are symptoms, and a woolly, useless brain. I'm going for more tests tomorrow. I do hope you can get this sorted quickly, it sounds really dreadful. Oh, my word verification is 'shivered'...is the ether trying to tell us something? Thanks, fly, me too. I'm going for an echographie this evening which means no eating for the rest of the day!!! Pity I didn't have more for breakfast. Love the mot juste word verification!